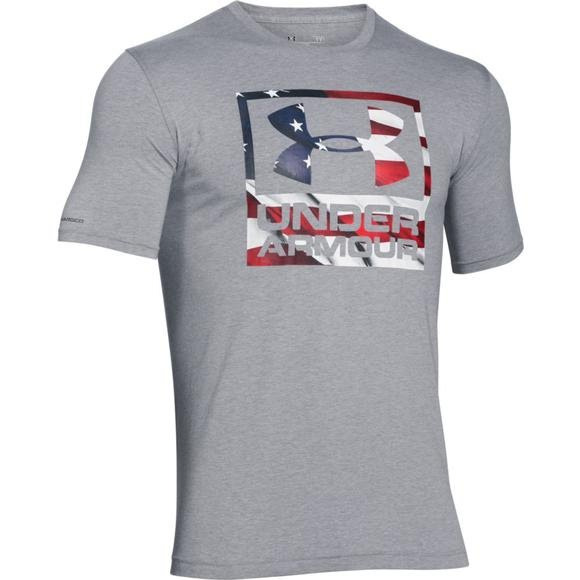 With a loose, fuller cut for complete comfort, the Under Armour Men's Big Flag Logo Short Sleeve T-Shirt features HeatGear®, Moisture Transport System, and anti-odor technology to help keep you feeling cool and dry. With a loose, fuller cut for complete comfort, the Under Armour Men&apos;s Big Flag Logo Short Sleeve T-Shirt features HeatGear®, Moisture Transport System, and anti-odor technology to help keep you feeling cool and dry. Fabric that has the comfort of cotton, but dries much faster. For when it&apos;s hot. Keeping athletes cool, dry, and light. Ideal use: Extremely warm weather. Over a decade ago, HeatGear, the original second skin layer, sparked the revolution of performance apparel and rendered cotton obsolete. UA&apos;s signature Moisture Transport System wicks sweat from the skin to keep you drier, lighter, and more comfortable than ever. Helps eliminate microbes that cause odors.